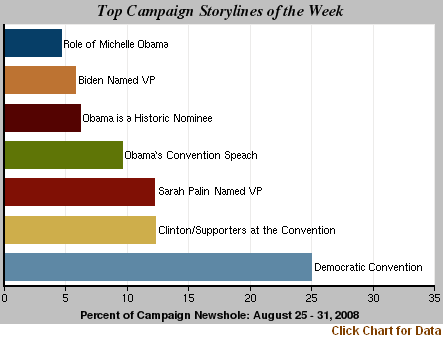 Coverage of the 2008 Presidential campaign reached its highest level last week with the drama-filled Democratic convention and the stunning Republican choice of a running mate. When it was over, the campaign filled 69% of the overall newshole from Aug. 25-Aug. 31, according to the Pew Research Center’s Project for Excellence in Journalism. That represents, by a substantial margin, the highest level of weekly election coverage since PEJ began tracking it in January 2007. The previous high was 55% the week of Super Tuesday. Last week also kicked off a new phase of the campaign with Election Day looming two months away. 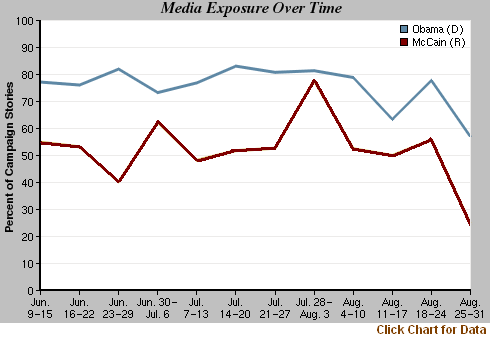 From June 9 through Aug. 24—the so-called summer doldrums when voters prefer the beach to politics—the campaign accounted for 27% of the overall newshole examined by PEJ. Last week, with the convention season underway and the VP selections completed, that total more than doubled. With the media focused on Denver for the first part of the week, Barack Obama and his convention dominated campaign coverage. But John McCain’s pick of Alaska Governor Sarah Palin—which caught the press and political establishment off guard—abruptly changed the subject and redirected the narrative from the Democrats to Republicans. Indeed, in just two days, Palin emerged as a bigger story overall for the week than her Democratic counterpart, Joe Biden. Even though her selection came late in the week, Palin was a significant or dominant factor in 12% of the campaign stories, according the Campaign Coverage Index. That compares with 8% for Biden, who spent much of last week in the limelight and gave his acceptance speech. From Aug. 25-31, Obama was a significant or dominant factor in 57% of the campaign stories, lower than his average in the last few months. McCain, who might otherwise have all but disappeared, was a factor in 25%. The narrative on its face was perhaps predictable. The elements of the Democratic convention and Biden coverage accounted for more than two-thirds of the campaign newshole. The No. 1 storyline was the convention itself (25% of the newshole) with Obama’s acceptance speech accounting for another 10%. (According to Nielsen, it was seen by about 38 million people, the biggest TV audience for any convention speech.) The theme of Obama as an historic candidate filled 6% of the coverage as did Biden’s selection and speech. Michelle Obama, who spoke on Aug. 25, accounted for 5% and Ted Kennedy’s emotional appearance generated another 2%. But as has been the case in many weeks, the theme of Democratic drama and discord—and the role of the Clintons—also grabbed the media’s attention. Hillary Clinton’s convention role and her Tuesday night speech—aimed at reconciling a party bruised by a tough primary fight—was the No. 2 storyline at 12%. The idea of a divided party generated 3% of the coverage. And Bill Clinton, whose chilly relationship with Obama had been widely documented, accounted for another 3%. Many of the media post-mortems suggested the Democrats had staged a successful event. But by noon on Friday, the surprise selection of Palin—whose name had been virtually absent from veepstakes speculation—changed the storyline on a dime. The media had been leaning toward Minnesota Governor Tim Pawlenty as the most likely choice. Once Palin was named, the early coverage appeared to focus largely on the political calculus, the risks and benefits of McCain adding the young, largely unknown conservative female Governor of Alaska to the ticket. Overall, the campaign filled at least half the newshole in all five media sectors last week and proved once again that conventions are largely television events. The campaign accounted for 79% of the network news airtime studied last week and 94% of the cable coverage examined. All of these findings are part of PEJ’s running content analysis of media coverage, called the News Coverage Index (NCI). During the election year, PEJ has added special coding to more closely examine coverage of the race for President and renamed the work the Campaign Coverage Index. (The full NCI data appear at the bottom of this report.) The CCI measures both the nature of the campaign narrative and the amount of coverage devoted to each candidate. The race for exposure is measured by the number of stories in which a candidate plays a significant role (as a subject of between 25% and 50% of the story) or a main newsmaker role (at least 50% of the story). The campaign storyline of the week—the specific themes that make up the campaign coverage—are measured as a percentage of overall coverage, or newshole. Once the Clintons pledged fealty to the Obama candidacy, that left the stage to the candidate himself. In this era of a cacophony of partisan commentary, it can be hard to find independent evaluations of something as crucial as a nomination acceptance speech. Generally speaking, the media gave Obama good marks, for an address that seemed to distinguish itself to many analysts for its toughness toward McCain and for its methodical attempt to address doubts that may have been planted in voters’ minds. “Obama’s speech was a point-by-point rebuttal of all the charges against him,” said National Public Radio’s Mara Liasson on the Aug. 29 broadcast of Morning Edition. Roughly 12 hours after that speech ended, it made way for another dramatic development—the Palin pick. Other revelations, including the news about Palin’s daughter, soon followed. And by the beginning of the Republicans’ convention, the original surprise about Palin’s selection was being supplanted in media coverage by questions about her vetting process. No other story last week was even within hailing distance of the presidential campaign, according to PEJ’s News Coverage Index. The No. 2 story, at 7% of the newshole, was Hurricane Gustav, which slammed into the Gulf Coast. (The brunt of the storm hit too late to be included in this report.) That was followed by coverage of the aftermath of the conflict between Russia and Georgia (at 4%). The situation inside Iraq was No. 4 at 2%. And coverage of the economy, which has been sliding slowly down the list of news priorities in the last month, was No. 5 at only 1%.